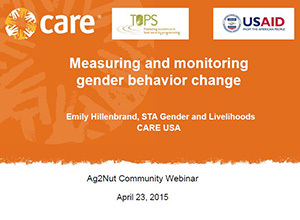 The April 23, 2015, Ag2Nut community call featured two new toolkits for gender in agriculture, food security, and nutrition. The event explored new thinking in this important area, as well as the application and complementarities of the two toolkits. Emily Hillenbrand of CARE presented a summary of several tools and processes that CARE has developed for measuring, monitoring, and encouraging processes of change among key intervention partners. These tools include a set of graduated, context-specific gender indicators for men and women in 5 countries (Malawi, Mali, Ghana, Tanzania, India). Lisa Roner and Meaghan Clark of Land O’Lakes presented their Integrating Gender throughout a Project’s Life Cycle 2.0 tool, whose guidance, toolkits, and checklists provide a go to document for gender integration in all aspects of project development and implementation, with an increased focus on gender analysis and project stakeholders.